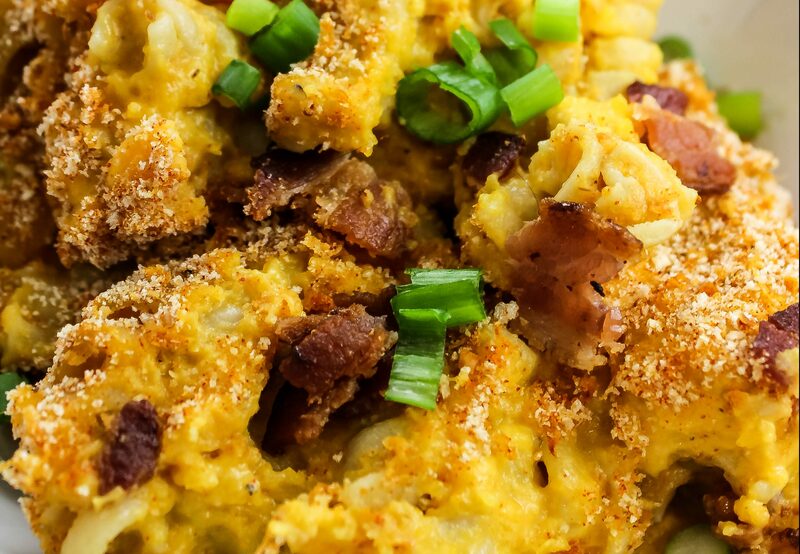 Bacon Butternut Mac & Cheese is a delicious healthy twist on mac & cheese. 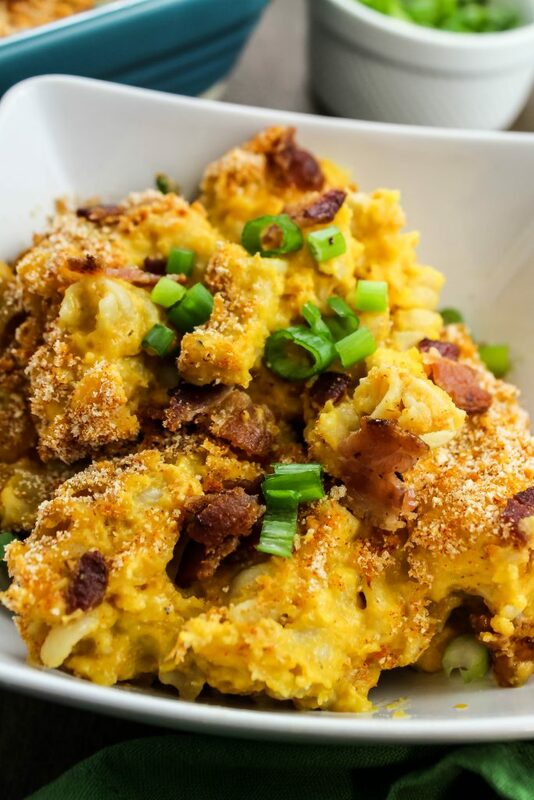 Squash puree mixed with cheese sauce & rotini noodles, topped with bacon & baked until bubbly. 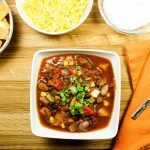 Weight Watchers friendly recipe- 8 SmartPoints! Macaroni and cheese… who doesn’t love mac & cheese? My husband claims to be a mac & cheese expert and if you ask him, there’s no such thing as too much cheese. 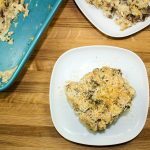 Macaroni and cheese can be a rather glutinous dish, so I’ve created a guilt free version. 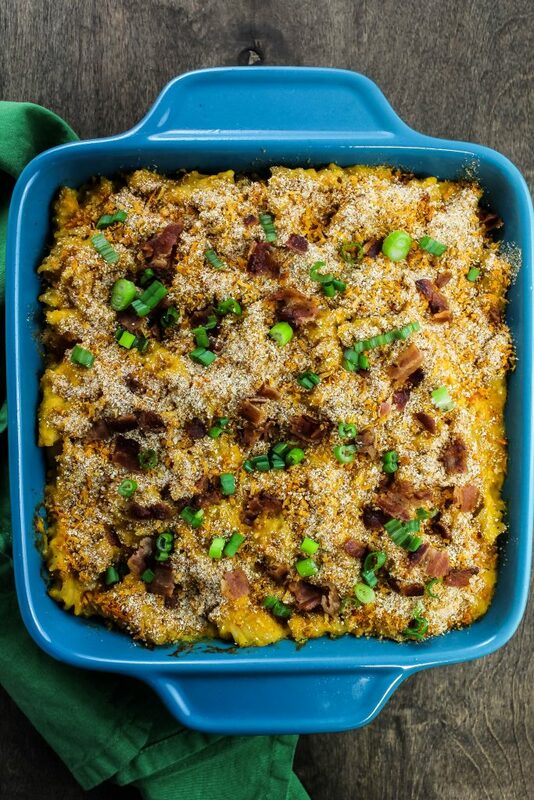 My Bacon Butternut Mac & Cheese has all the best ingredients of traditional mac and cheese with a delicious twist. Roasted butternut squash puree mixed with a creamy cheese sauce and rotini noodles, topped with bacon and baked until bubbly. 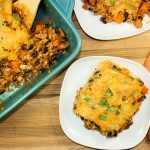 This is a Weight Watchers friendly recipe and each serving is 8 Weight Watchers SmartPoints. Butternut squash is a regular in my house during the fall. I just LOVE cooking with this squash. Usually, I buy a big butternut squash and use it for two recipes during the week. It’s a pain to peel, so I tend to tackle that task after I’ve had my coffee for the day 🙂 Just like my husband, I love macaroni and cheese. I don’t eat or make mac & cheese too often because it’s not very Weight Watchers friendly. This recipe is my cure when I’m carving macaroni & cheese at home. 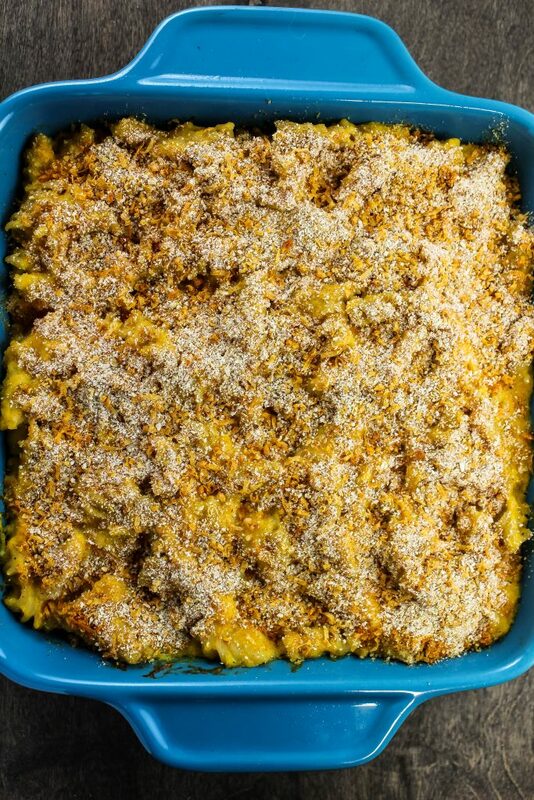 The trick to make this mac & cheese version healthier is the addition of butternut squash. 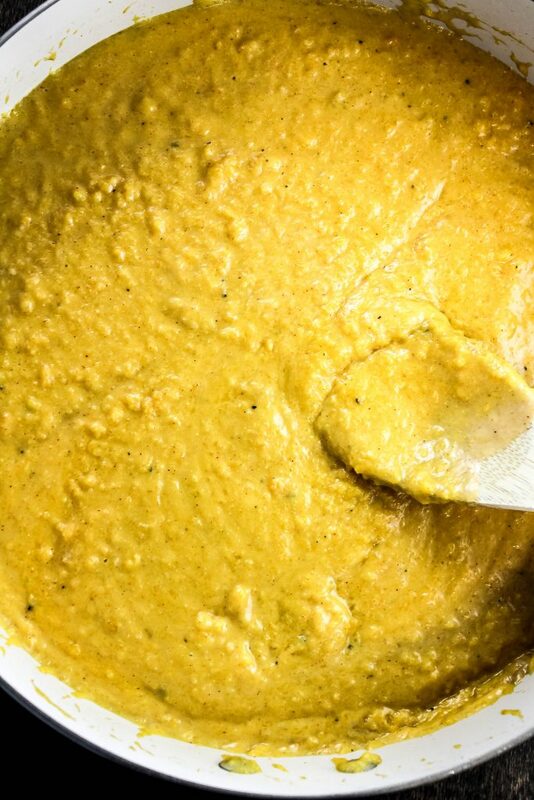 When butternut squash is roasted and pureed, it turns into a creamy and delicious base for any pasta dish. In my mac & cheese, I use less cheese to keep the Weight Watchers points low. The great trick is that you can’t even tell this version is healthy because of the creamy butternut puree! To start, peel butternut squash, remove the seeds, and then dice into 2 inch cubes. Spread onto a baking sheet, drizzle with olive oil and season with salt and pepper. Mix to coat the squash. Roast in the oven for 25 minutes until the squash is fork tender. 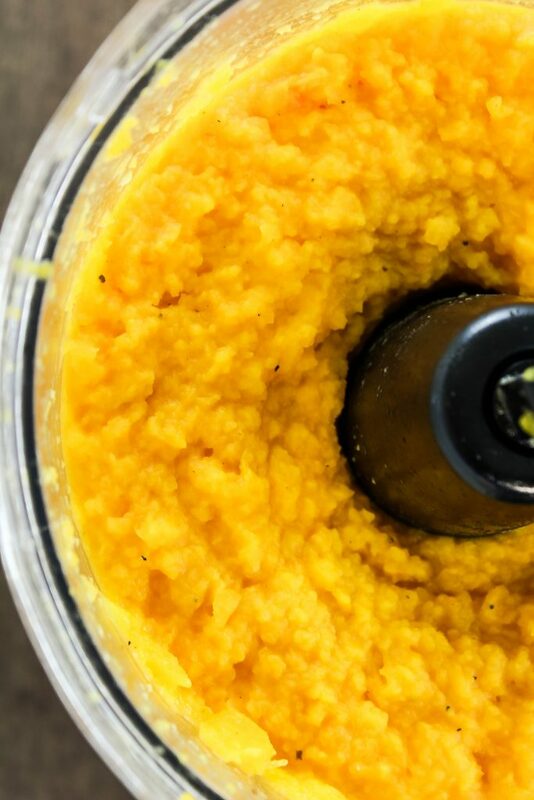 Add the squash to a food processor and blend until smooth. Homemade mac & cheese MUST have a delicious cheese sauce and mine is super easy to make. Heat a large skillet over medium low heat and melt butter. Slowly add flour and whisk. Cook for 1 minute. Slowly add evaporated milk and vegetable broth and whisk continuously, until smooth. Add spices then shredded sharp cheddar cheese. Mix until the cheese is melted. Add the pureed butternut squash and mix until well combined. Add cooked rotini pasta to the squash mixture and mix well. Pour mixture into a greased casserole dish and spread into an even layer. Sprinkle the top with breadcrumbs the bake for 15 minutes, until bubbly. Garnish with green onions and crumbled bacon!! 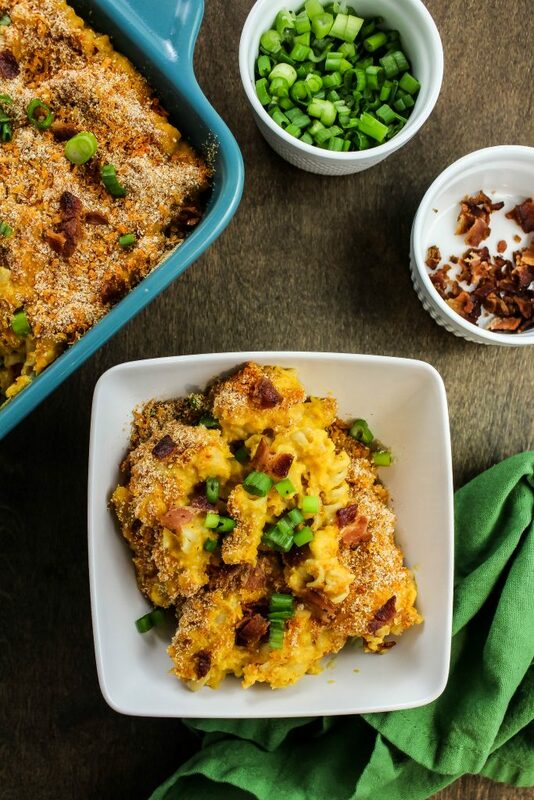 Bacon Butternut Mac & Cheese has all the best ingredients of traditional mac and cheese with a delicious twist. Roasted butternut squash puree mixed with a creamy cheese sauce and rotini noodles, topped with bacon and baked until bubbly. Guilt free without compromising flavor! This would be a great healthier side dish for Thanksgiving! Less than 10 grams of fat and 8 Weight Watchers SmartPoints per serving! Peel squash, remove seeds, and dice into 2 inch cubes. Spray baking sheet with cooking spray and spread butternut squash onto sheet. Drizzle with olive oil and season with 1 teaspoon salt and 1 teaspoon pepper. Mix well. Roast for 25 minutes, until squash is fork tender. 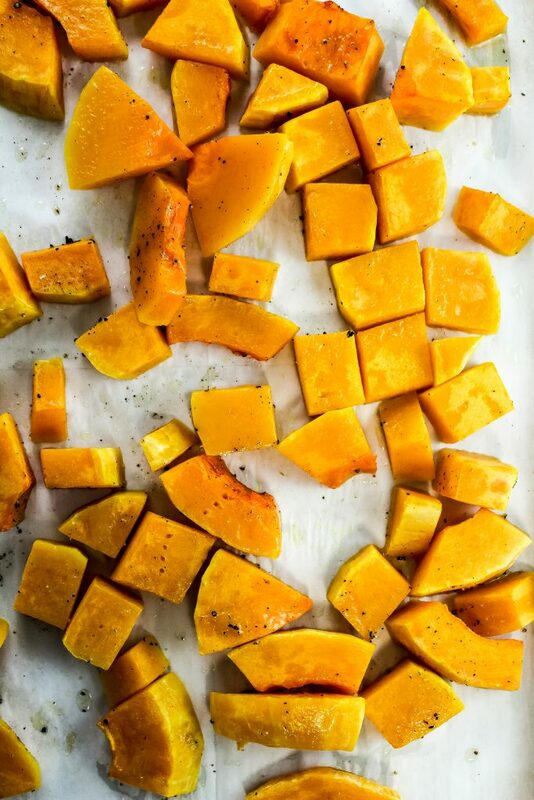 Add roasted squash to a food processor and blend until smooth. Set aside. Cook rotini noodles according to package instructions and set aside. Slowly add flour, whisking continuously, and cook 1 minute. 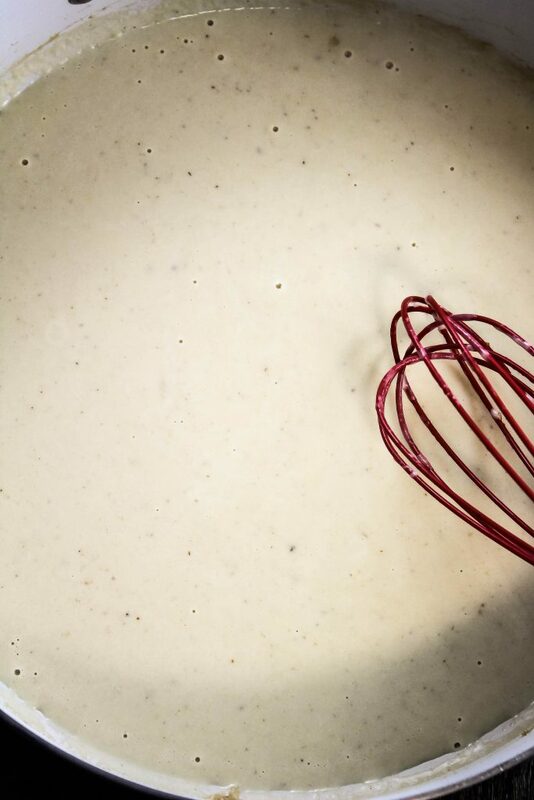 Slowly add milk and broth, whisking continuously to break up any clumps and let thicken. Add 1 teaspoon salt, 1 teaspoon pepper, garlic powder, onion powder, cayenne pepper, and Louisiana hot sauce. Add pureed butternut squash and mix until combined. Turn off heat and add cooked rotini to the skillet. Mix well. Pour pasta into a casserole dish and spread into an even layer. In a small bowl, mix breadcrumbs, parmesan cheese, and smoked paprika. Sprinkle top with breadcrumbs mixture. Garnish with green onions and crumbled bacon. November 7, 2017 at 10:42 am Oh WOW! 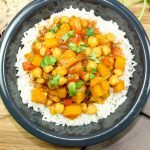 This looks so great - yummy and perfect for the cooler months. Adding to my list to make! November 7, 2017 at 4:25 pm I'd love to try this, this looks absolutely delicious! We are huge mac and cheese fans!